My main method was to create duplicate layers, erase the text in the speech bubble, and add text. I also selected the head with the free select tool, flipped it, and anchored it back. I touched up a little bit with the pencil to close gaps created by rotating. If I were to do it over (and I might), I would just have a background layer, with the speech cloud blank, and a right-facing head. Then I could use smaller layers for the wording and the flipped head. This would save file size. Also, if this were to be a draft of a real cover, color would need to be added. 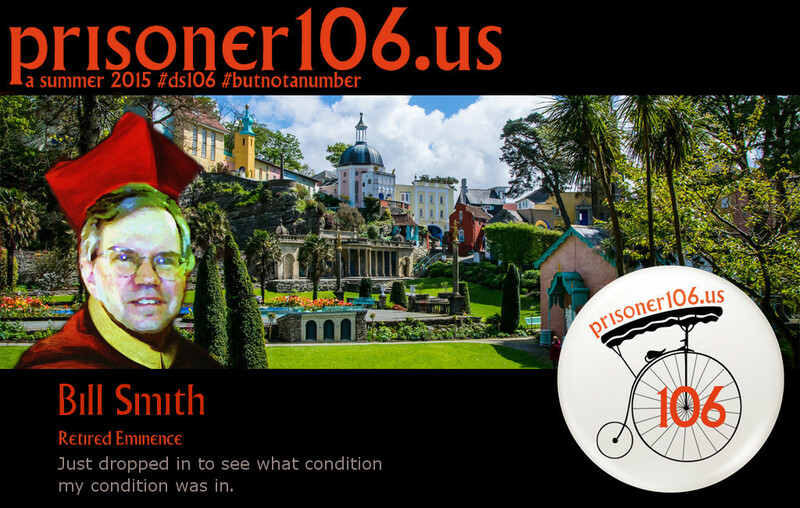 This entry was posted in Prisoner106 and tagged DesignAssignments, DesignAssignments306, prisoner106. When I look at the Jack Kirby draft for The Prisoner comic, I just want to get out my mediterranean-pastel pencil crayons and colour away. That might make for a fun assignment. It’s a shame that it was never finished. The animation of the head is superb. Although it would be over the top, I know I would be tempted to add a head bobble in there somewhere, to accompany some particularly witty comment from Number Six. If you do re-visit this, you might want to try to match the hand-lettering font using a site like whatfontis.com to upload a small image of the first couple of words “the television screen” to find a hand-lettering comic-style font with a slight slant to the right. For a re-visit, I would also take more care with the head. Notice how the part of his hair moves from one side to the other? When I was a kid, I sometimes carbon-paper-traced comic books so I could redo the art. Kind of what we can now do with image editing software. Thanks for the tip on the font. I forgot all about that and just used MS Comic Sans as “close enough” and a toss-of-the-bone or slap-of-the-glove to those who disparage that font. Now that you mention the part, I see it. But it doesn’t really cause any concern. It’s perfect. I was thinking of doing a colouring book daily create! Pick a page you like and submit one! We can colour it in 😉 So cool! I have not spent time with the comic yet but want to. A nice idea to get the comic into our giffing marathon! I might play too!